Or view larger version. Uncle Bill and Others at Mining, Placerville, California. 1852. Unknown photographer. Daguerrotype. Collection of Oakland Museum of California. 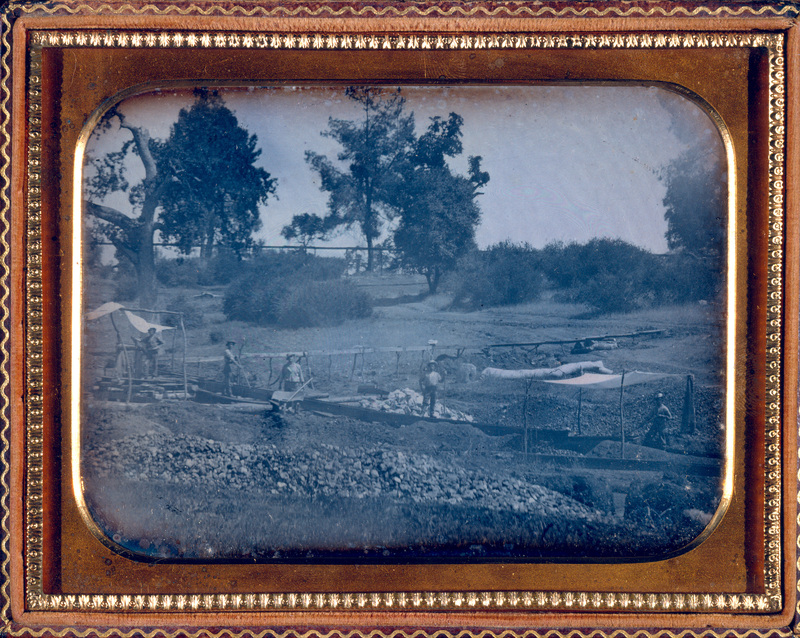 This is a daguerreotype photograph showing placer gold mining during the California Gold Rush. Placer gold is surface gold found in sand or gravel in rivers and creeks. These miners are shown standing among several sluice boxes. The sluice box is a tool used in gold mining in which, a long trough style box with riffle bars or raised blocks on the bottom of the trough, trap pieces of gold as water, sand, and gravel wash through the box.